Is the Cloud 9 gang still on the clock? Has the Superstore TV show been cancelled or renewed for a fifth season on NBC? The television vulture is watching for the latest cancellation and renewal news, so this page is the place to track the status of Superstore, season five. You can bookmark this page or subscribe for the latest updates. Remember, the television vulture is watching your shows. Are you? An NBC workplace comedy, Superstore stars America Ferrera, Ben Feldman, Colton Dunn, Nico Santos, Nichole Bloom, Mark McKinney, and Lauren Ash. This sitcom revolves around the diverse employees at a super-sized megastore called Cloud 9. Amy (Ferrera) is the glue that holds the place together while newer hire Jonah (Feldman) wants to prove that work doesn’t have to be boring. From bright-eyed newbies and seen-it-all veterans to the clueless seasonal hires and the in-it-for-life managers, the crew tackles the day-to-day grind of rabid bargain hunters, riot-causing sales, and nap-worthy training sessions. The fourth season of Superstore is averaging a 0.86 rating in the 18-49 demographic and 3.24 million viewers. Compared to season three, that’s down by 15% and 13%, respectively. Compare its standing against the other NBC TV shows we are tracking. Superstore has been renewed for a fifth season which will debut TBD. Stay tuned for further updates. 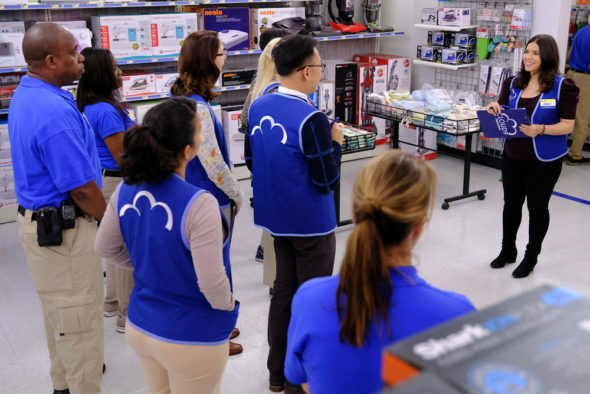 Will NBC cancel or renew Superstore for season five? The numbers are down but I think they’ll renew it, in order to have a bigger syndication package. If the ratings really tank, all bets are off. For now, I’ll keep an eye on the Nielsens and update this page with breaking developments. Subscribe for free updates on any Superstore cancellation or renewal news alerts. 3/4/19 update: NBC has renewed the Superstore series for a fifth season. TV show ratings are still important. Follow Superstore‘s weekly ups and downs. Read other Superstore TV series news or other NBC TV show news. What do you think? Did you think that the Superstore TV show would be renewed for a fifth season? How would you feel if NBC had cancelled this TV show, instead? Must RENE or my husband will be DEVASTATED!!! PLEASE renew! We have been waiting for the next season, such a great cast! RENEW!!! Anxiously awaiting season 5!! Renew it PLEASE! So good! It’s my favorite sitcom. I love every character. RENEW! It’s one of the best sitcoms on the air!